This St. Patrick’s Day marks another milestone for Boston, the 10 year anniversary of the city’s greenest mode of transportation, Boston Pedicab. During the past decade, the pedicabs have become a local fixture on the streets of the city, truly becoming a regular sight in Boston and must-do attraction. 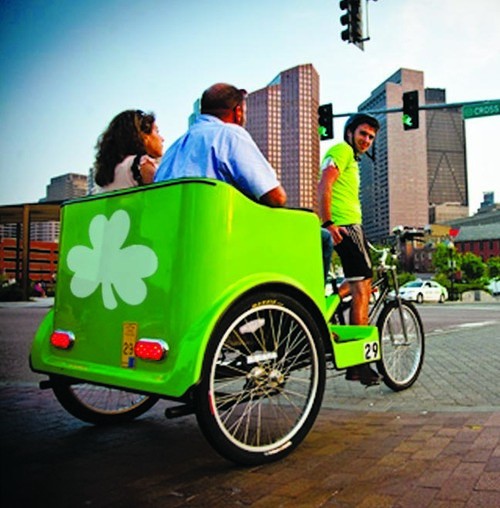 On St. Patrick’s Day 2005, Northeastern University student, Ben Morris took his first ever pedicab passengers from Solas: Irish Pub to Newbury Street and he was hooked. Since that day, more than a half a million pedicab rides have been given and the company shows no signs of slowing down. Since 2005, the company has evolved to operate in nine cities around the country, along with serving in several more with their out-of-home advertising division Pedicab Outdoor. Earlier this year, the company also entered into the manufacturing industry with the launch of their own American-made pedicab, The Coaster. Designed and built domestically, the Coaster is expected to serve as the next generation of pedicabs. While the classic pedicab will continue to operate on busier days, more and more of the improved pedicabs will be seen on the streets in 2015. Boston Pedicab has been operating out of the same South End shop since 2005 and can be found riding the streets seven days a week 11am-11pm. For more information about their services, please visit bostonpedicab.com. Founded in 2005, Coaster Pedicab Inc. (http://www.coasterpedicab.com/) is a privately-owned company based in Boston, MA that is the leading provider of pedicab-based solutions in the United States. Coaster Pedicab specializes in providing operations, advertising (pedicaboutdoor.com), manufacturing (coasterpedicab.com), and technology (pedicabmanager.com (http://www.coasterpedicab.com/management)) services for the emerging pedicab industry.